No one wants their campsite or boat to smell like an outhouse. Not only is the smell unpleasant, but it can attract unwanted guests like flies and rats. Also no one wants to use a toilet that looks unclean within the bowl or to have to clean a bowl without a brush, running water and detergents only available in your home. (Lets face it, most of us don't even want to do this in our home either!) With the Earthtec 5 Gallon Portable Toilet, odor and bowl sanitation is never an issue. Exclusive to Earthtec’s portable toilets, each toilet comes pre-treated with a stick-resistant nanotechnology polymer. This revolutionary advancement is designed so no waste will adhere to the bowl and is a renewable surface treatment to aid in cleanliness and sanitation. Re-application of the polymer is an easy two-step process. The first step is to spray on the bonding agent that prepares the surface for the treatment and the second step is to apply the nanotechnology anti-stick treatment. The application of the polymer treats plastics to create a Teflon-like non-stick surface to aid in the sanitation and cleaning of this product. Foreign matter simply rinses away and the majority of the time cannot even stick enough to need to be rinsed. We recommend rinsing with water only. Re-treatment is done by the owner using the two-part spray can process. Additionally exclusive to the Earthtec portable toilet is our easy pour waste spout. Waste is stored in a sealed, air-tight holding tank. When the tank is full, carry the base of the toilet to a disposal area. Rotate the spout away from the body of the toilet and easily pour the waste into the refuse hole without worry of splash or spillage. Other toilets on the market have a cap on the top of the waste tank. In order to dump the waste tank the entire full tank must be lifted and tilted before any begins to pour. The end result is a rush of waste, an inaccurate pour, splashing of the waste, and drippage down the side of the tank...general disgustingness. The Earthtec portable toilet is your solution to this unwanted sanitation hazard. Cleaning the Earthtec 5 Gallon Portable Toilet is easy. Simply separate the fresh water tank and the waste holding tank and then add fresh water (and detergent if necessary) to the fresh water tank. With Earthtec portable toilets, comfort and sanitation are key. EarthTec 5 Gallon Portable Toilets are sit down toilets capable of supporting up to 350 pounds; built above and beyond general standards required for usage. Unlike most portable toilets that are waterless or only capable of holding 4 gallons of water at best, this portable toilet has a 5 gallon capacity. This makes it possible to flush the Earthtec 5 Gallon Portable Toilet up to 50 times. A higher storage and flush capacity adds longer usage without refilling or running out of flushes. 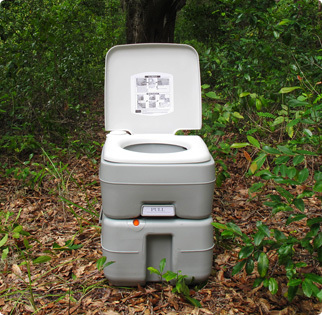 The Earthtec 5 Gallon Portable Toilet is also easy to transport and store. Weighing just under 13 pounds and measuring 16.5 x 14.6 x 16.9 inches, this portable toilet is compact and gets the job done in the smallest of spaces. Earthtec portable toilets recommends that you store your 5 Gallon Portable Toilet out of extreme sunlight and heat (usually under 122°F) and occasionally lubricate the slide valve with a lubricant like Vaseline. Earthtec portable toilets also offer accessories for your 5 Gallon Portable Toilet, including armrest and height brackets for improved comfort, cleaning supplies, and a toilet tent for extra privacy. The Earthtec portable toilet is also covered under a limited one-year warranty.